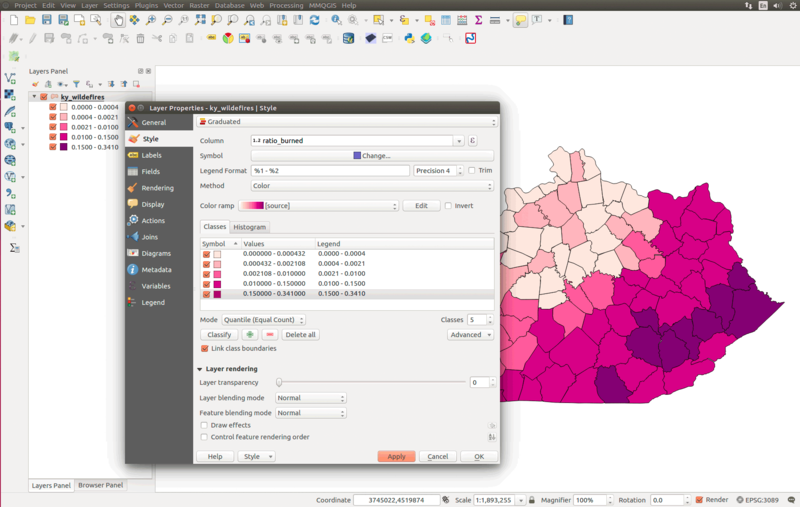 This module takes point-level data and explores analysis techniques for their thematic representation using QGIS: spatial joins, hex binning, and the heat mapping. There is an updated version (2017) if you want to use that dataset instead. Also contains 1:500k scale county and state polygons from U.S. Census Bureau Cartographic Boundary Shapefiles, but you can use the county and state polygons from the previous lesson. In a previous lesson, we joined attributes from different tables based on a field of shared values. In this lesson, we'll join attributes from different layers based on shared locations of their features. We'll do a point in polygon or many to one spatial join that will count the number points from one layer that are within polygons of another layer. We have another type of spatial join, the one to many which will join the attributes of the one that intersects the many. Imagine if you GPS mapped public water fountains in your city and you want to add attributes from a polgon layer, e.g., city council districts. A one to many spatial join would add the attributes of the council district to each intersecting water fountain point. We'll leave this type of join for another day. The many to one spatial join is easy to imagine for our lesson; we have locations of wildfires and we want to aggregate them by county to identify which county has the most wildfire. We will create summary statistics for our attributes, such as the average fire size by state or the largest fire in each county. Because our attribute table doesn't offer consistent information describing in which county the incident occurred, we will spatial join point to polygon to analyze patterns at different units of geography. As we found in a previous lesson, if we map raw quantities, e.g., total acres burned in a county, we'll need to normalize by the size of the county. This requires that we divide the sum of the area burned by the county's area (being sure to convert the areas to same unit). This would create a choropleth map showing the ratio of county's area burned by wildfire. What if we joined wildfires to polygons of the same size? This technique is called hex binning and helps quickly visualize point density across an area. What are hexbins, aka hexagonal grids, and why are they cool for mappers? Hex binning is a technique used to aggregate a large number of points into hexagonal grids. The method is similar to making a choropleth map, though rather than taking political boundaries as the aggregation unit, we tile equally-sized, adjacent, and non-overlapping polygons. The regular hexagon is our polygon of choice, so you should review the hexagon's curious geometry. We'll create hexagonal grids using the MMQGIS plugin and/or the PostGIS functions developed by CARTO. A tiled grid can be comprised of squares, equilateral triangles, or hexagons. With over 1.7 million records in our dataset, we will need a good way to visualize and analyze these points. We'll spatial join to aggregate by county and hexagonal grids. Unlike our previous lessons, we will need to transform our layer's coordinate systems to a local or equal-area CRS. For displaying maps, we use the 'on the fly' projection method to make our layers overlap regardless of the layer's source CRS. When we use geospatial algorithms that have distance as an input parameter, e.g., creating hexagons of a fixed size, we need to use a projected coordinate system with a linear unit of measure. Most of the geospatial data we find online, especially small-scale vector data, is in either WGS84 or NAD83, which are geographic coordinate systems. These geographic coordinate systems are the standard for a web mapping workflow, and we'll always need to manage them properly. For example, we know that we need to export GeoJSONs in a WGS84 CRS to use online. Try geojson.io to verify your web mapping layers. However, a hexagon grid generated in WGS84 or NAD83 will not maintain equal areas for hexagons across a large area, which defeats the purpose of hex binning. So, we need to find a local projected coordinate to use in our analysis. Let's review our projected coordinate reference systems and find a good CRS for our state. We call these local CRS as compared to global CRS. We have (generally) two families of local, projected CRSs we can use, Universal Transverse Mercator (UTM) and State Plane Coordinate System (SPCS). UTM zones span the globe, based on the WGS84 GCS, and always have a meter as the linear unit of measure. The State Plane Coordinate System was developed to maintain the highest level of measurement capability on maps of U.S. states. They are tuned to each state, and most states have multiple zones tuned to even smaller regions in that state. They are based on the NAD83 GCS with multiple datum realizations (correcting for the shifting of North America due to plate tectonics) and offer both meter and feet linear units of measure. Both families maximize the accuracy of measuring shape, distance, and area for the areas they cover. If we create a hexagon grid in one of these coordinate systems, then we're confident that our hexagons will maintain identical areas in any projection. Which to use? UTM zones are pretty easy to use, but if you want foot as a linear unit of measure, you'll need an SPCS zone. If your state has many SPSC zones, generally the Central Zone or Single Zone will be good for the entire state. For example, Kentucky has a single zone SPSC (EPSG: 3089). For small scale maps, we have used North America Albers Equal Area Conic projection (EPSG: 102008) for and the Mollweide projection (EPSG: 54009). Central Meridian (lon_0) is the longitude where you want the map centered. Hawaii is -156°. A third parallel might be given (lat_0) which is either a Latitude of origin or Latitude of center. The later is between lat_1 and lat_2. The Latitude of center is 22.5°. These parallel and meridian values don't have to be exact. Visit epsg.io and look at the Well Known Text (WKT) for any CRS to discover the parameters. 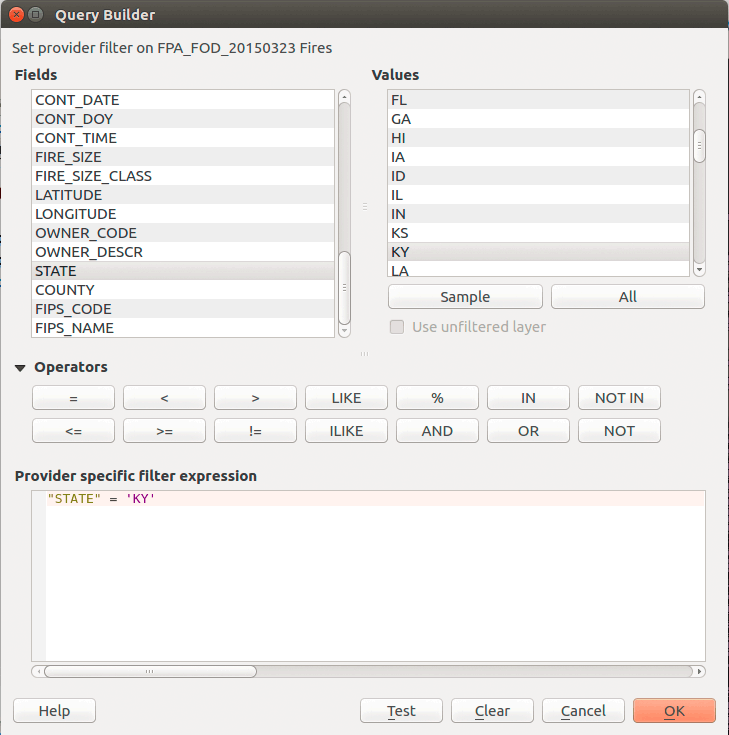 QGIS uses the PROJ.4 definition and of course our spatial database would use SQL (PostGIS). For more details about PROJ.4 parameters, visit http://proj4.org/. In our workflow, we'll render features for our area of interest (from datasets in NAD83 or WGS84) to a new spatial database layer (or GeoJSON layer) in the desired projected coordinate system. Because we're doing analysis with multiple layers, we need to make sure they are all in the same projected CRS. If we want to publish our results to an interactive web map, then we'll eventually Save As.. the analysis ouptut layer to GeoJSON with a WGS84 CRS. 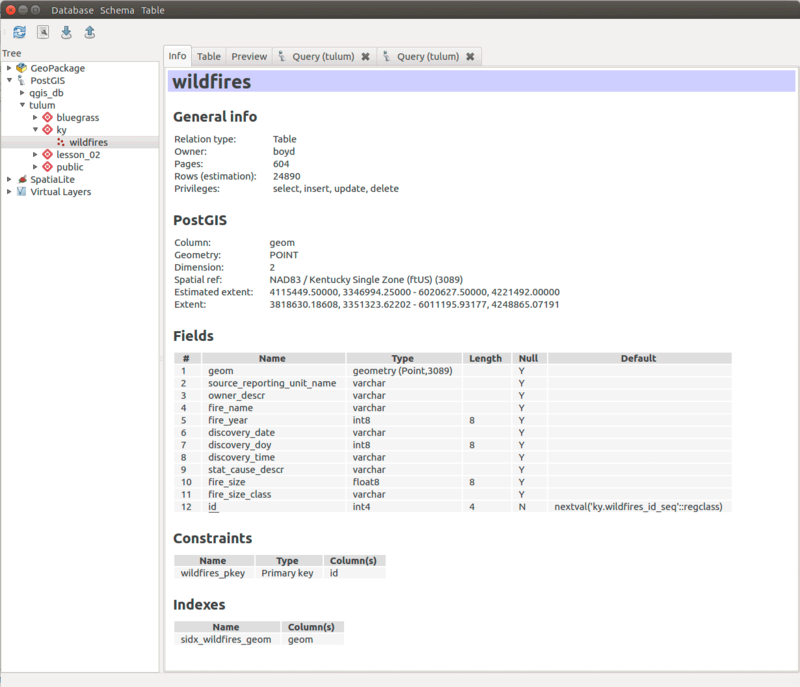 Extract and connect the "Wildfires_1992-2013_NAD83.sqlite" database. 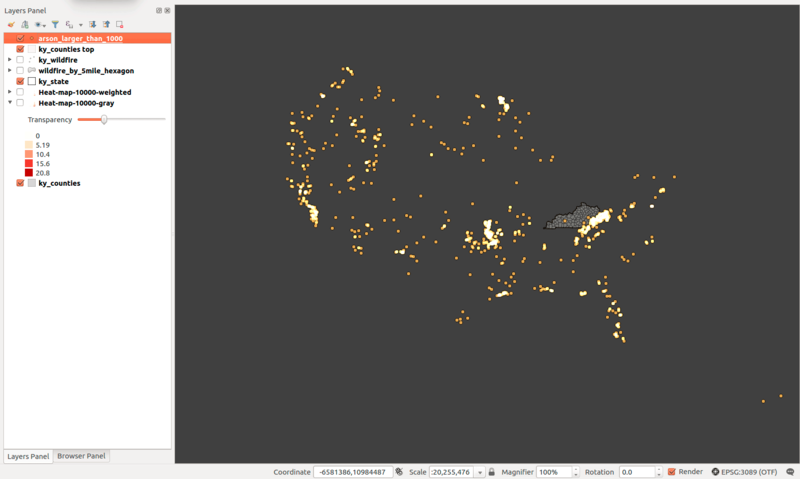 The database contains over 1.7 million points representing wildfires. While that is a large dataset by itself, the database contains a spatial index for the layers. That adds considerably to the file size of the database but has important advantages we'll address later in the lesson. You may select any state to analyze for this lesson. I will select Kentucky and use the Kentucky State Plane single zone US foot (EPSG:3089), the official CRS for the state. Let's move the wildfire data from the SpatiaLite database to our PostGIS database, where we can leverage spatial indexes. 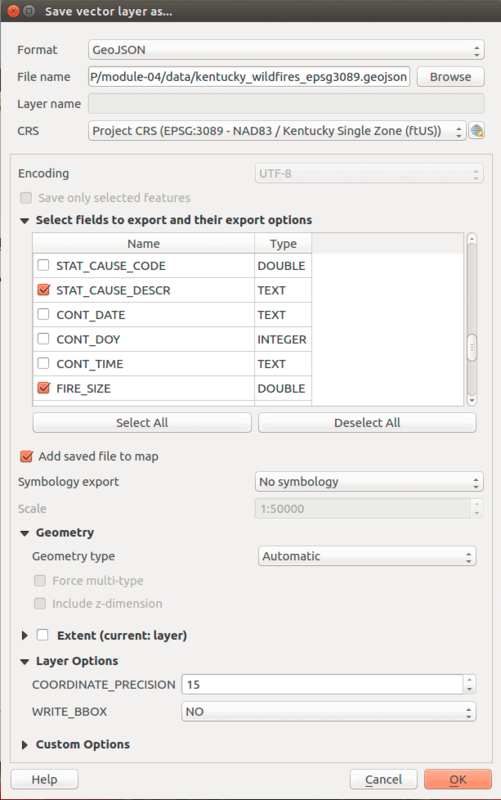 PostGIS can create a spatial index that relates all geometry features in database. 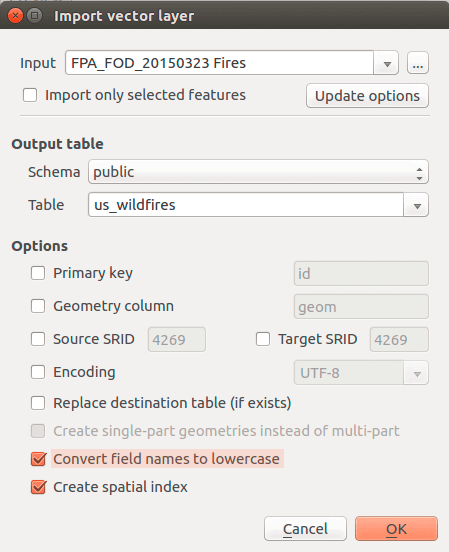 If we want to find which wildfires intersect a county, PostGIS queries this hidden table to quickly find matching records. This is done largely behind the scenes as long as we enable Create spatial index either during import or in DB Manager's Info table for the folder. 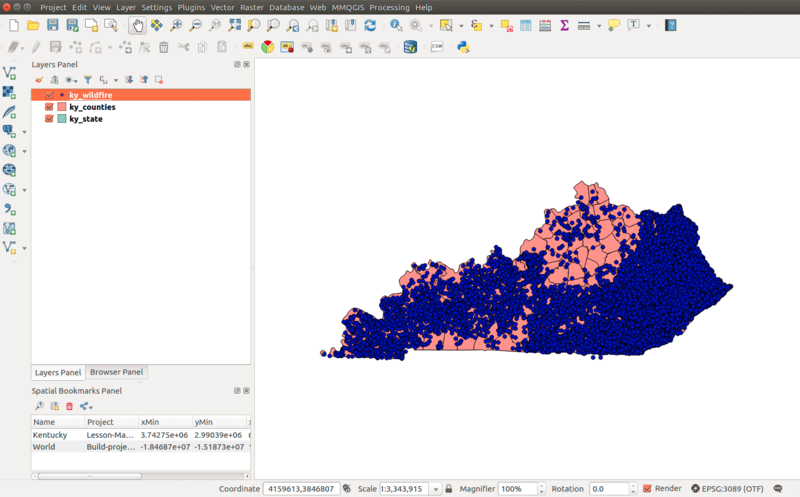 Read more about PostGIS spatial indexing. Let's first import the entire wildfire dataset into our database. This might take a little time, but it should be successful. 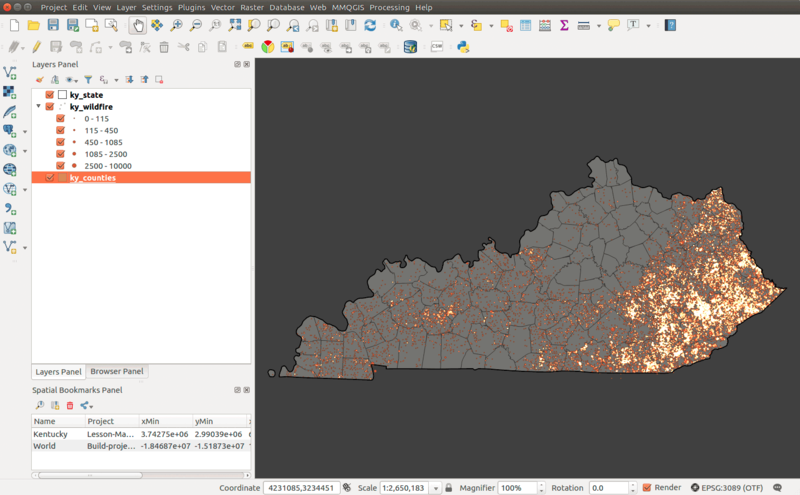 execute some SQL queries to isolate our state and transform the layers' CRS when we add them to our new schema in PostGIS I'm calling "ky" and intend to maintain all of my spatial layers in the EPSG: 3089 CRS. You can keep your layers in the public schema, but you should be aware of the CRS for your layers. 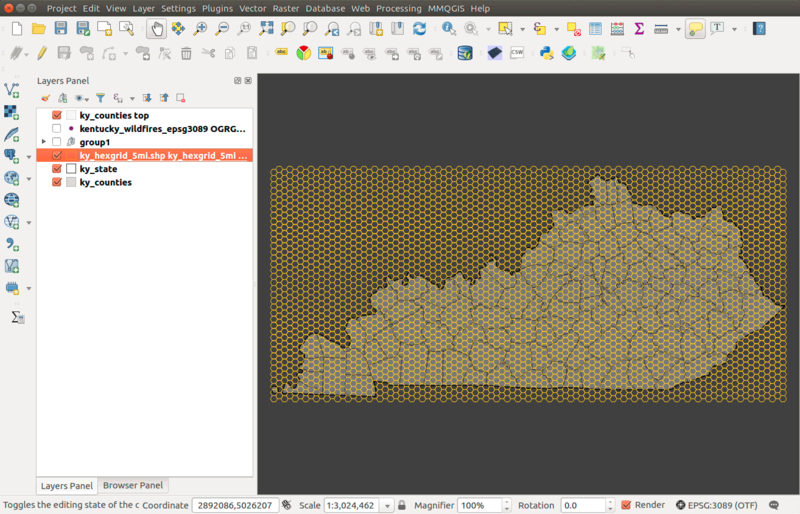 Now create queries to use on the county and state layers to extract Kentucky. Verify your database has Kentucky wildfire points, counties, and state outline. This is a decent visualization of wildfires in Kentucky. We're using the unique feature blending modes to imply wildfire rates; glowing areas imply more wildfire. However, we might need to quantify the rates, i.e., "what is maximum amount of wildfire area burned?" To accomplish this, we need to calculate the amount of wildfire area burned by an enumeration unit. We can count fire by county and then normalize by the county's area. The hexbin provides a useful unit, because we can easily show density with a spatial join as all hexagons are the same size. 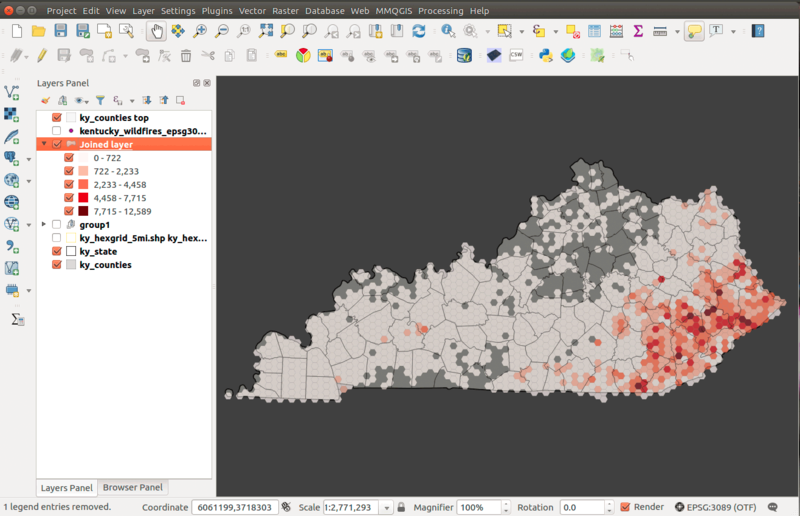 QGIS has wrapped this type of analysis into a nice tool. We won't have the same type of control over attributes as we do in a spatial database, but it works. 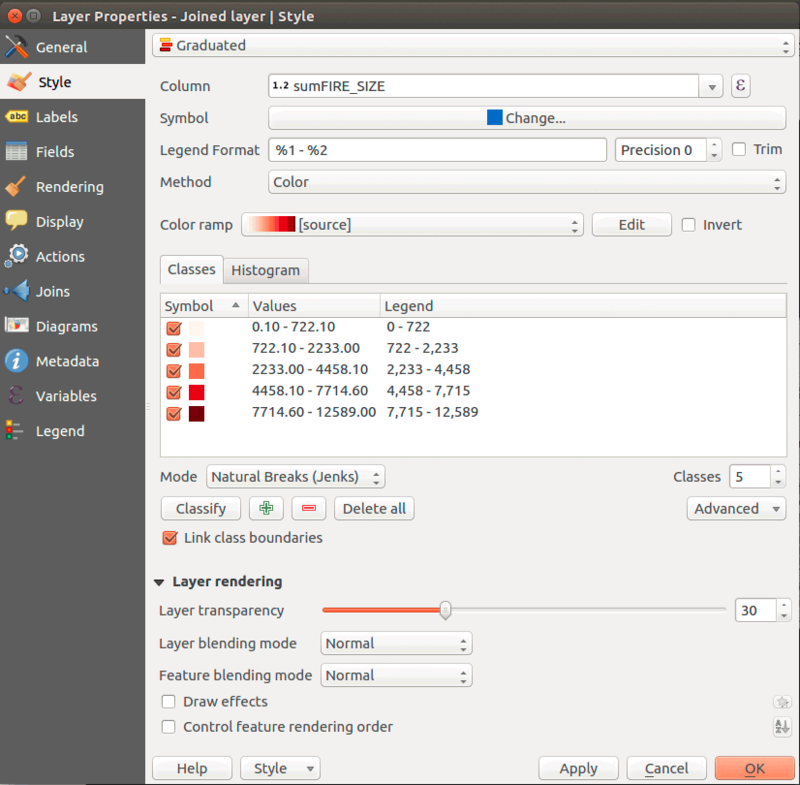 First, make sure you have the point and polygon layers in your Layers Panel. 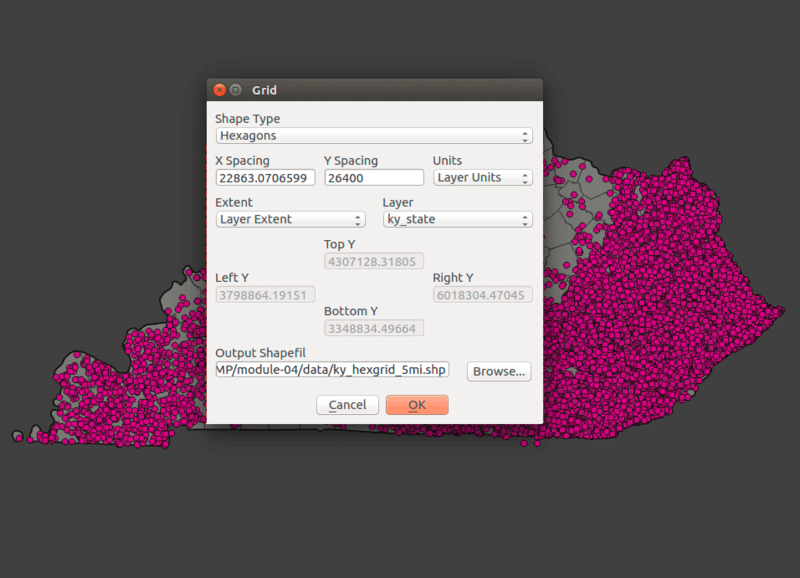 QGIS tools use these layers for selecting input. 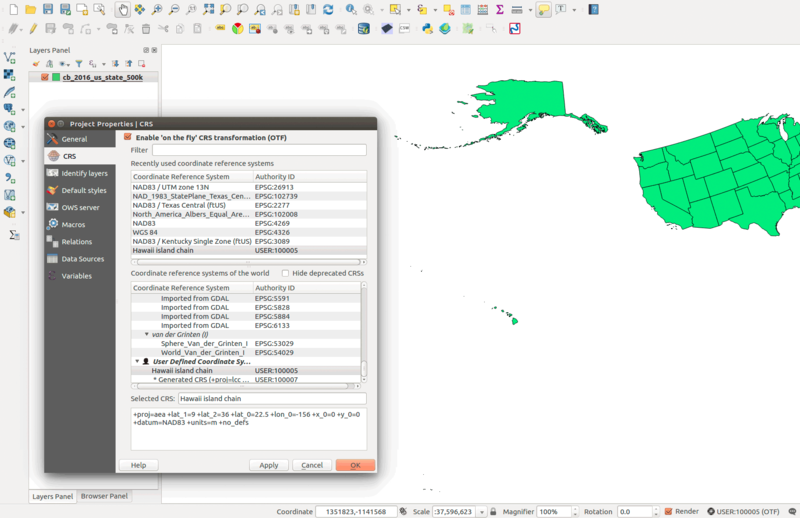 Find the tool in QGIS menu > Vector > Data Management Tools > Join attributes by location. Let's discuss some considerations using this tool. First, you should use the GeoJSON layers with minimal fields or remove as many fields as necessary from a database layer. If any number field is encoded as a TEXT data type, this tool also won't change data types "on the fly". Also, every NUMERIC attribute will be subjected to summary statistics you select, though they might not make sense. So, as always, we need to be aware of our attributes before using this tool and convert them if necessary. Depending on the format to which we output, we could change our column names. If you don't specify a name in the Joined layer output you are making a temporary layer. You shouldn't have any field name changes. That's the preferred method. 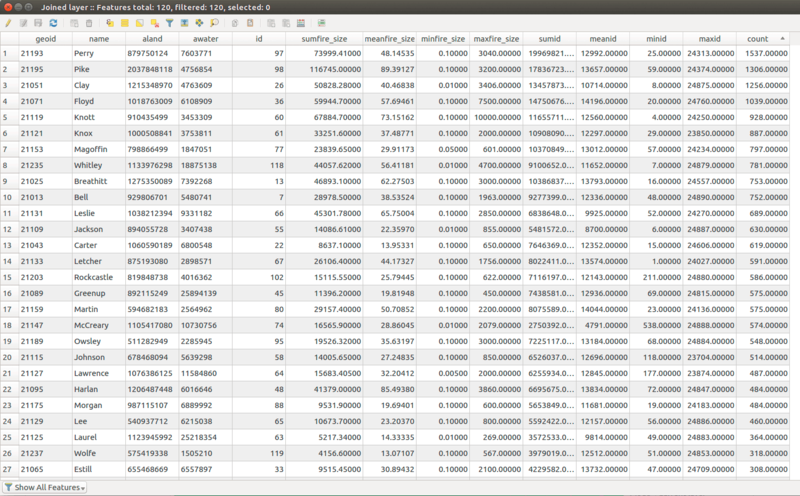 If you add a name for the output, it defaults to Shapefile format and truncates our long column names. Look at the fields, sumfire_size and count. This aggregates the acres of fire and the number of fires for each county. Many of these attributes are not useful. Let's not take a look at this method in PostGIS. PostGIS is very efficient with spatial joins, but we'll divide the process in two steps. We'll find where points intersect spatially using the st_intersects() function and group by clause. 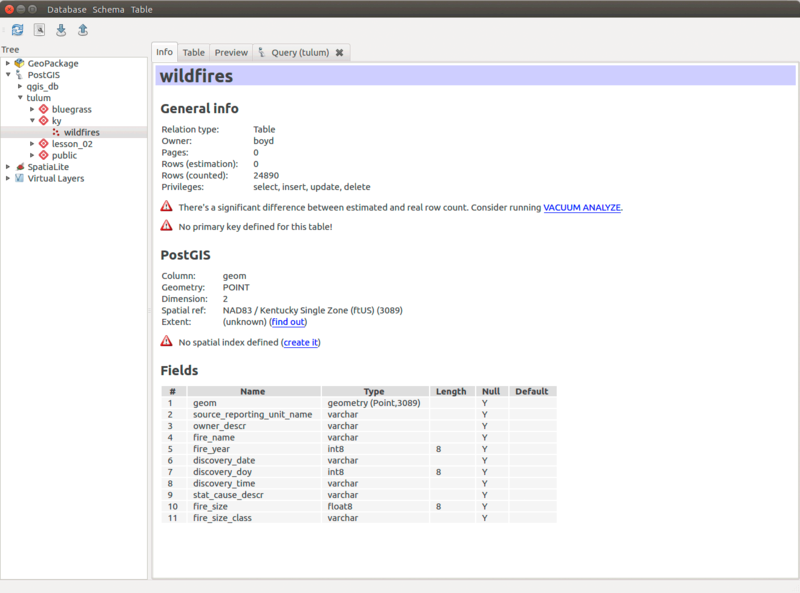 This will create an attribute table that contains the fields geoid, sum_fire_acres, and count of wildfires. Then we'll do an attribute join using the 'geoid' to attach the analysis table to the geometry table. do a spatial join aggregating wildfire points by hexagon. 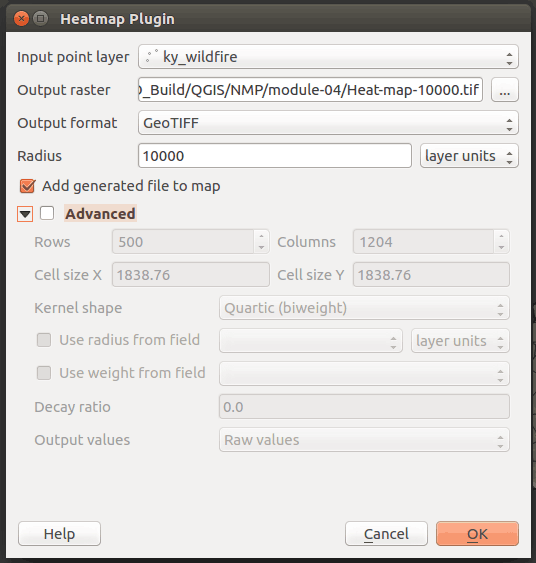 Let's start with the QGIS tool-based workflow using a plugin to create the hexgrid and then tool to perform the spatial join. It outputs to a Shapefile. After a successful output, take a look at the attribute table. You should have a field called "sum_fire_size" which is total acreage per hexagon. You can sort by this field (double-clicking the field name) and select the record. That will highlight the hexagon with the most fire. The next section will explore the same process in SQL. This tool provides convenience but lacks many of the options we find in our SQL method. Remember to save your successful SQL queries as .sql text files and reusing on different databases and datasets. We'll create hexagonal grids using a PostGIS function created by CARTO (formally CartoDB). A PostGIS function adds extra geoprocessing capabilities to our database. 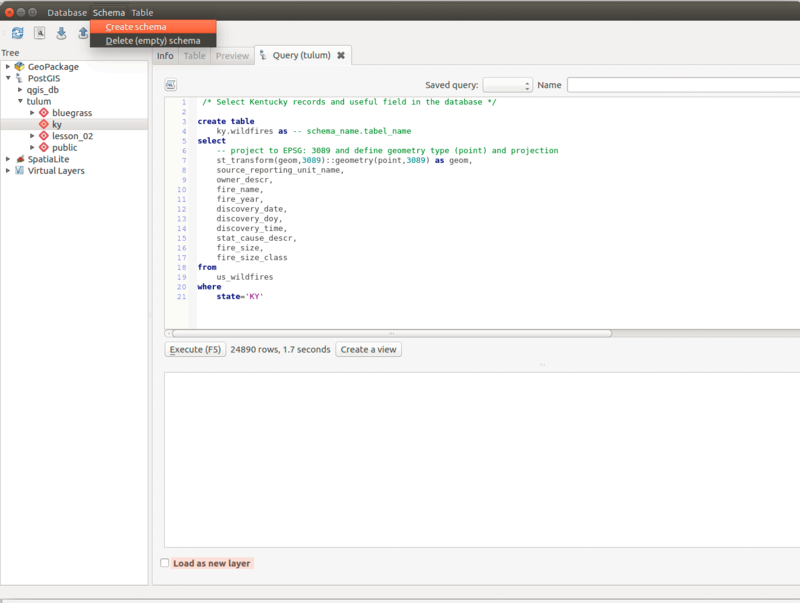 You can visit their repository to find more functions and will use their _CDBHexagon.sql function. You can make a hexagon exactly 5-miles wide on the long diagonal (outer diameter) with the equation side = diagonal/2. Hexagons in an equal-area projected CRS also have the same area when they're projected to other CRSs. That's the purpose of hex binning; making polygons of the same size to measure density. /* Tip. Uncomment the following line to delete previous versions. This procedure is exactly the same of joining wildfire points to county polygon. The main difference is using the id field as the group by column. Let's do the spatial join and then attribute join. Note that we don't need to normalize unless you want to show the ratio of burned area in each hexagon. Let's now turn to representing the same data with the heatmap, a visualization technique that produces a density raster. 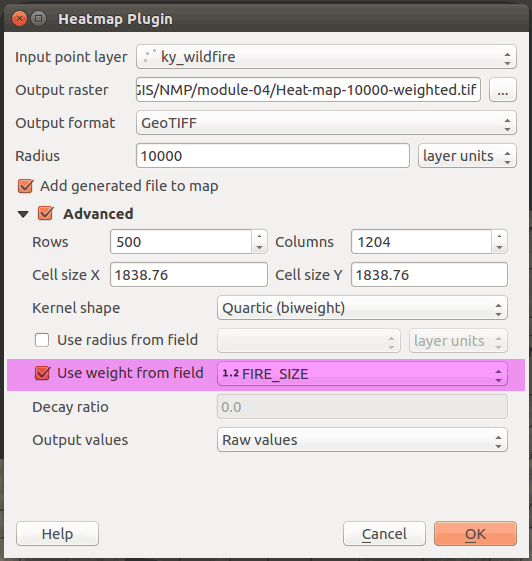 This tool is often called a kernel density function and the QGIS's help explains that it will "create a density (heatmap) raster of an input point vector layer. The density is calculated based on the number of points in a location, with larger numbers of clustered points resulting in larger values. Heatmaps allow easy identification of "hotspots" and clustering of points." Ensure that the heatmap plugin is installed and activated. 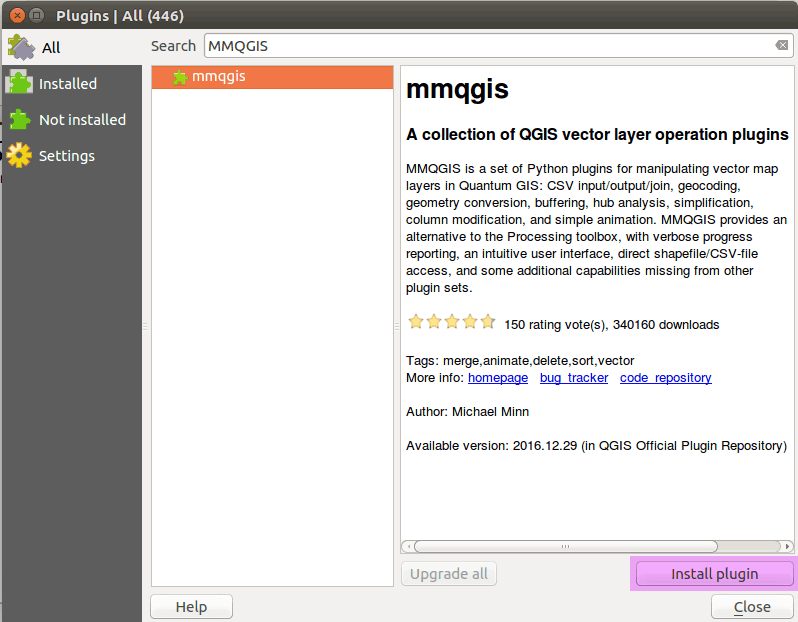 In QGIS main menu find Plugins > Manage and Install Plugins... > Heatmap. 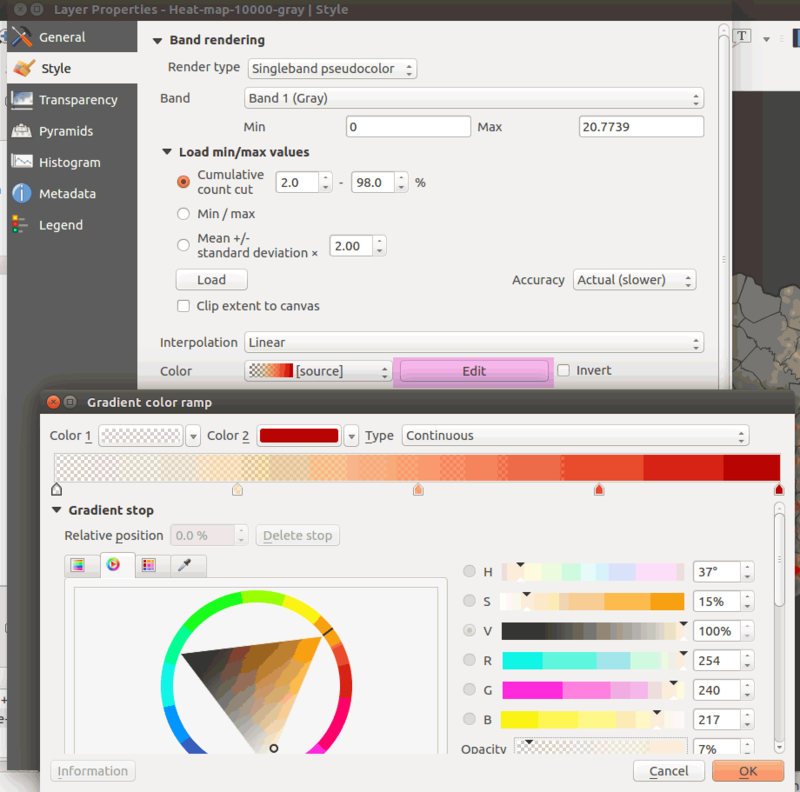 Open the Heatmap Plugin (Raster > Heatmap > Heatmap ...). 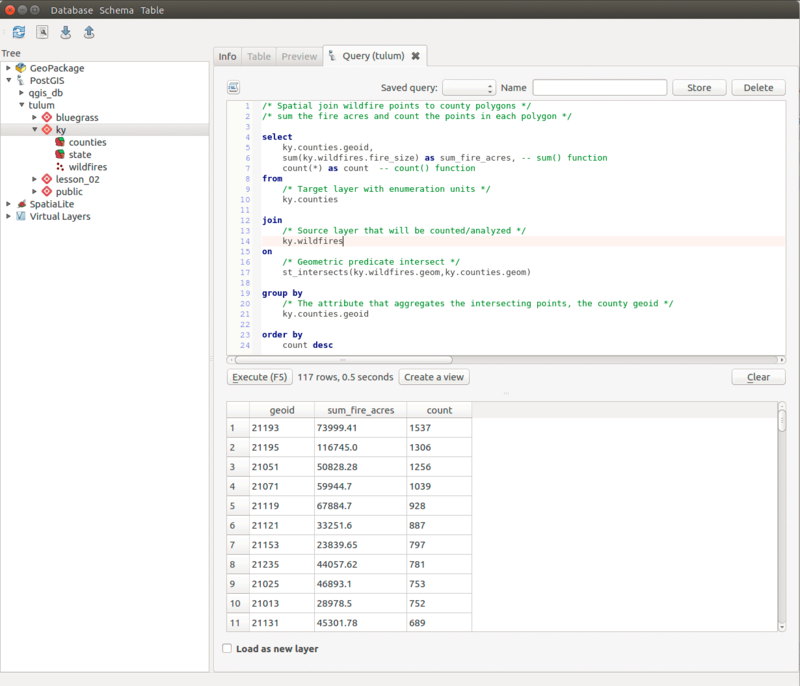 Within this dialog, select the wildfire point layer as input. The plugin will write a raster file in a GeoTIFF format to disk. Each cell in this raster will be a numeric value representing the number of fires per some area. Adjust the Radius parameter to 10,000 feet, which "specifies the distance around a point at which the influence of the point will be felt. 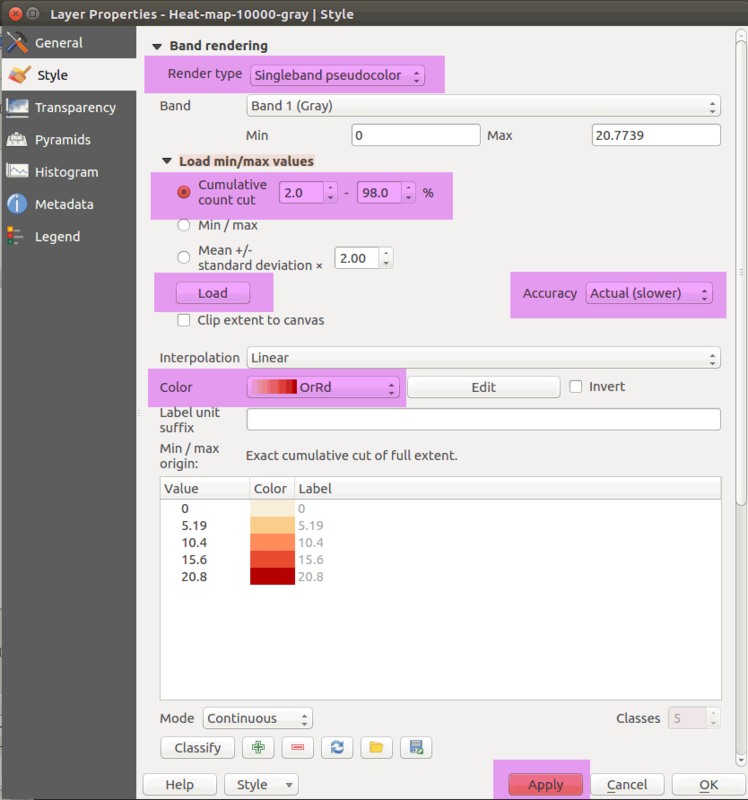 Larger values result in greater smoothing, but smaller values may show finer details and variation in point density," as described in QGIS's help documentation. Leave Advanced option disabled for now. Let's look at an example using the search Radius parameter. If only two fires happened in a search radius and they happened at the same location, you would get an output value of 2 (fires per search radius). If they more distant than the search radius, the output value would be 1. If they were half the distance of the search radius from each other, the output value could 1.5, but it could any value between 1 and 2 depending on the kernel shape) that defines the significance of neighboring points. 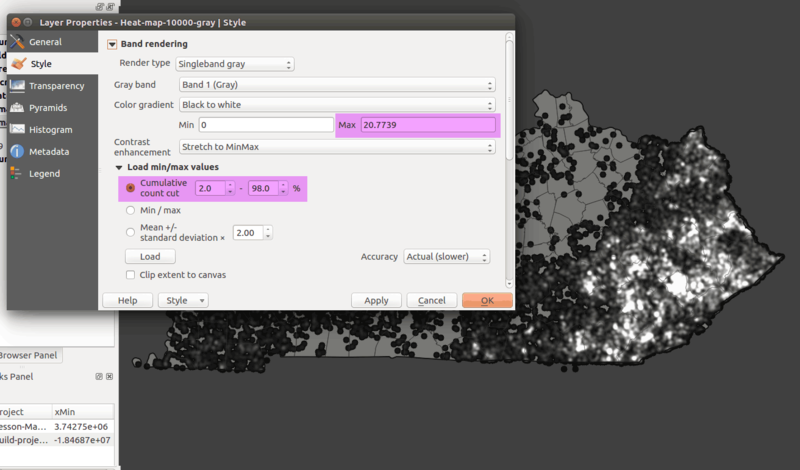 The default result is a raster map where the lightest color indicates a high density of the given phenomena and the darker color shows a low density. You could say occurrences of fire in the search radius. If our search radius was sufficiently large, the output value would be very close to the total number of fires in the point layer. The values of the raster are currently being displayed using a continuous singleband grayscale. 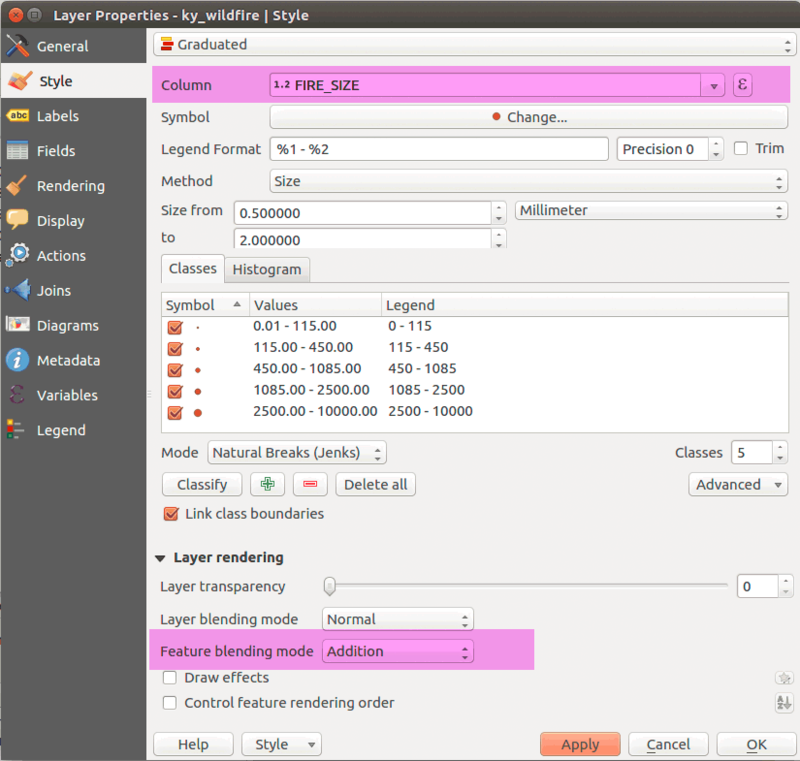 Let's take a look at the raster layer's Properties > Style tab, which is significantly different than vector styles. 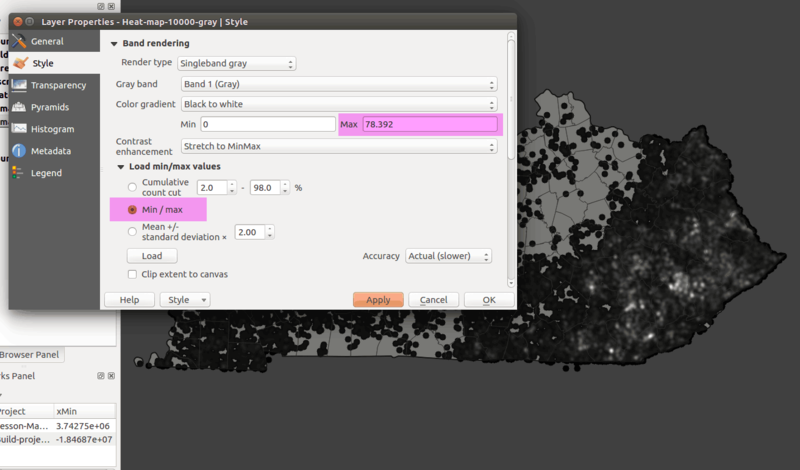 Using the singleband gray Render type will help us understand how raster cell values get colored on the map. However, it's a very exciting image and we how more options with different render types. Let's produce a colored version of this raster by adjusting the layer's properties. 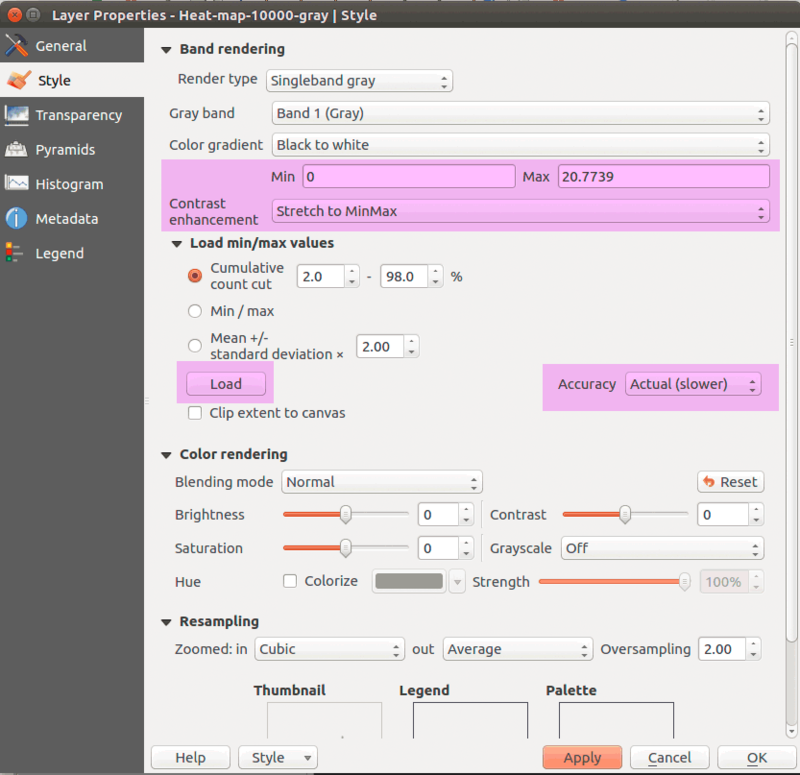 Under Render type, choose Singleband pseudocolor using a OrRd color scheme. We have the option to embed widgets in the legend. The default widget is a transparency slider, which allows us to conveniently change a raster layers transparency. This map shows the amount of land burned by fire (some areas burned multiple times over two decades), while the count of fires per search area shows the frequency of wildfire. It should be obvious that it takes only one wildfire to create massive damage. As we can see, the heatmap gives us a lot of options to visualize spatial patterns, but it takes experimentation to find an appropriate setup. Keep at it and don't view my examples as the only option. One last tip for working in raster: use transparency for your raster layers. As we have explored in this lesson, we have numerous techniques to visualize point data in QGIS. Let's summarize the techniques we've used so far in a few maps. Let's explore some techniques to improved our productivity and experience with spatial databases. Here is where SQL can be shine. Imagine we want to add summary tables or clean up data to serve popup content on a web map. We need a way prep and combine field values to make a pretty table or popup. We'll use a couple numeric and string functions to prep and use the concatenate operator to combine string data. After a successful query, you can export that as a GeoJSON in the WGS84 CRS and you're ready for web mapping! Let's flirt with an ambitious goal. When we introduced the CARTO function to tesselate hexagons for our hex binning exercise, we used PL/pgSQL a procedural programming language supported by the PostgreSQL. This language is included by default with new server installations and other languages can accessed with extensions. create or replace function -- just as the words say!